Cold, dark, wet. Foggy, windy, icy. All weapons in the arsenal of a British winter in what, for many runners, is a one sided fight that leaves us cowering under coats and umbrellas in our cars and on stuffy public transport. If the bleakness and harshness of a winter’s night doesn’t deter you from sticking to your all important training schedule, then there is the fear of being unseen and completely at the mercy of traffic. Thankfully, PUMA have decided that 2014 is the year to fight back against the night and keep keen runners out of the gym and in the fresh, if slightly frostier, air. Their solution is the LED #ForeverFaster range that is NightCat Powered. This offers reflectivity with the added benefit of constant protection through LED light. NightCat Powered is a user-controlled adaptive technology that makes it possible for running gear to change according to visibility conditions and features a Jacket, a backpack and shoes. The super-light LED unit (4.7 g) is used in apparel, footwear and accessories. It is fully rechargeable (mini-USB cable included) and has both blinking and steady light options. Sport-locker.net was invited to PUMA HQ on London’s Southbank to road test the collection and it’s fair to say we’re converted. 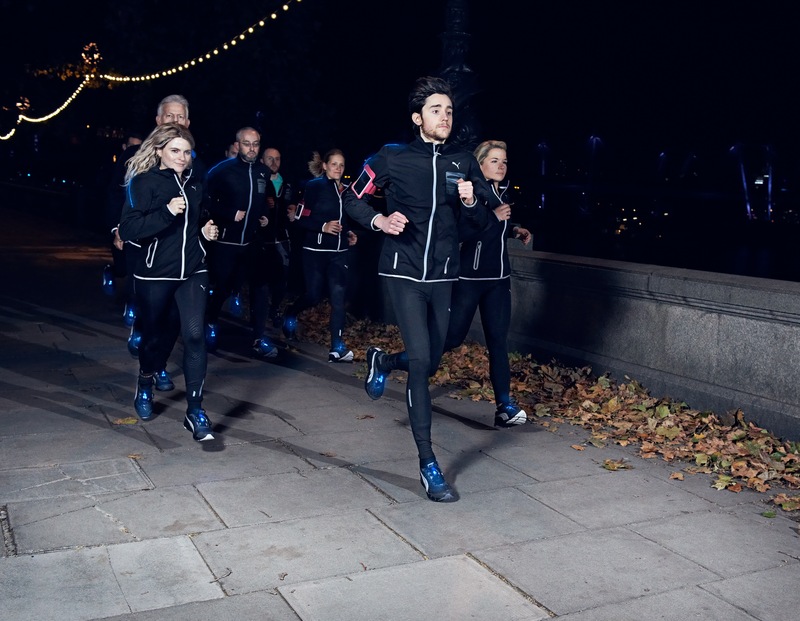 As the night drew in and the nation’s capital was submerged in darkness we zipped up our PUMA Pure NightCat Powered Jacket, laced our PUMA Faas 600 v2 NightCat Powered shoes and embraced the night. And it soon became apparent that the technology was doing its job as we became a head turning, dazzling, headline act drawing admiring glances on the streets of London. The fibre optic LED powered cable on the back of the jacket was unobtrusive and allowed us to maintain our natural running style without hindrance. Both the jacket and the shoes felt light and comfortable as we strode along the Thames boldly blinking electric blue. The LED colour stands out brilliantly against the sleek and stylish black colourway meaning you can ditch those ghastly neon, hi-viz, fluorescent health and safety jackets we’ve all been so reliant upon until now for visibility. Sport-locker.net was also treated to a chat with British long-distance runner and now Puma ambassador Chris Thompson, who among other things revealed his love for the PUMA Faas 300 and that he is targeting a marathon medal at the Rio Olympics in 2014. PUMA Product Manager Mark Miles then gave us the full detailed lowdown of the full Faas range before joining us for the 5km run to put the tech and the spec into action. NightCat technology simultaneously achieves the feats of being very noticeable (to the public/traffic) and completely unnoticeable (to the wearer – no obtrusion or irritation). 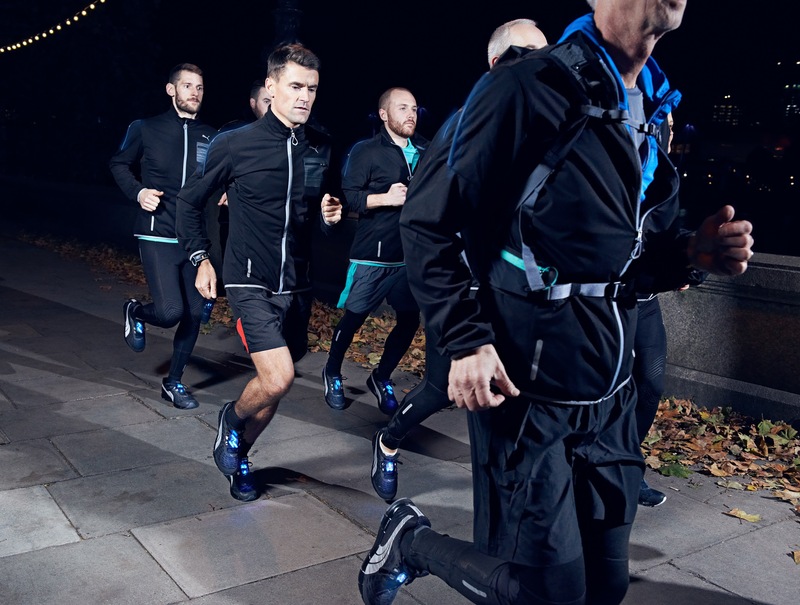 For the wearer this means you get all the benefits of a high quality, lightweight and complete running kit with the added security and confidence that being visible offers the night runner. So, no excuses to skip that evening workout. Whether it be dark, cold, wet, busy or potentially hazardous in the rush hour. Be seen, be safe, be nocturnal and be running. PUMA’s Nightcat Powered Range is reflective with a super light LED unit to increase visibility. Available from prodirectrunning.com from £90. What do you think of the PUMA LED #ForeverFaster range and the innovative use of LED technology? Let us know in the comments section below or on our Twitter and Facebook pages.